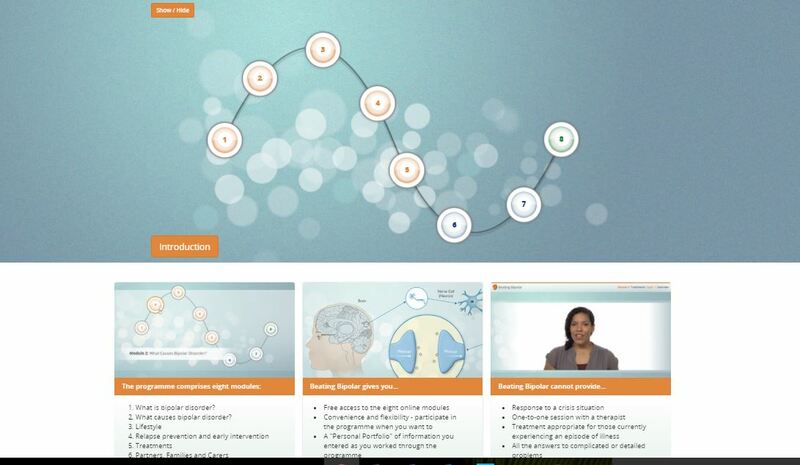 Beating Bipolar is a web based psychoeducation program intended to help users to cope with bipolar disorder. The program is comprised of 8 modules. Each module includes short videos of clinicians who deliver the psychoeducation and people dealing with Bipolar disorder that share some of their personal experience. Module’s topics include: what is Bipolar disorder? What causes Bipolar disorder? Lifestyle, Relapse prevention and early intervention; Treatments, Partners, Families and Carers; Women and bipolar disorder; and Bipolar and work. Throughout the program, some interactive tasks direct the user how to better manage their condition (e.g. mood charts, triggers). Lacks adaptivity to the user’s state. Beating Bipolar is an easy to follow program which is – due to its psychoeducational nature – mostly suitable for users who were recently diagnosed with Bipolar disorder or recently become aware to having it. For this population, Beating Bipolar could be very helpful in gathering some of the basic knowledge about: the condition, its effects on day to day life, and how to manage some aspects of the disorder. The program’s content is professional, clear and to the point. However, the program lacks some adaptivity to the user’s state (e.g. adjusting the content to the user’s needs, revealing the content gradually according to the user’s progress). Beating Bipolar could be recommended as part of an ongoing treatment, for patients and their loved ones, who cope with a recently diagnosed bipolar disorder. The program could best be used as an educational tool.